The Academy and the Society of Actuaries (SOA) will host a jointly sponsored life webinar, “Emerging Underwriting Methodologies in a PBR World Webcast,” which will introduce actuaries to the SOA’s Delphi study on emerging underwriting methods and their impact on mortality experience. The study’s aim was to provide practitioners and regulators with clarity and benchmarks around emerging underwriting techniques and suggest possible adjustments to base mortality tables with respect to VM-20—Requirements for Principle-Based Reserving for Life Products. The presenters are Lauren Cross and Matt Monson; moderating will be Mary Bahna-Nolan, chairperson of the Academy’s Life Experience Committee. The webinar will be held on Tuesday, Dec. 18, from noon to 1:30 p.m. ET. Register today. The Academy will host two webinars this month offering opportunities for continuing education (CE) credit. The final professionalism webinar of the year, “More Tales From the Dark Side: Ethical Cases at the ABCD,” will be held on Thursday, Dec. 20. David Driscoll and Godfrey Perrott, both members of the Actuarial Board for Counseling and Discipline (ABCD), will share examples of ethical problems based on cases that have been brought before the ABCD. Register here. “Big Data and the Role of the Actuary” to be held on Wednesday, Dec. 19, will draw from the Academy’s Big Data Task Force monograph of the same name that was released in June. Task force member panelists—Academy Health Vice President Audrey Halvorson, Bob Miccolis, and Martin Snow—will discuss current and emerging practices, important regulatory and professionalism considerations, and the current state of the InsurTech field. Big Data Task Force Vice Chairperson Dorothy Andrews will moderate. Register today. Academy Past President Robert Winters (1976–77) died this week at the age of 86. A New England native, Winters was a Korean War veteran, former chairman and CEO of the Prudential Insurance Company of America, and a past board member of the Business Roundtable, the Mayo Clinic, the Episcopal Divinity School, Honeywell International, and his beloved Boston Symphony Orchestra. “He was so tremendously proud to be an actuary, and to continue to build the field through his work with the Academy,” said his daughter, Beth Porter. In lieu of flowers, the family asked for consideration of a donation to the Boston Symphony Orchestra or the Mayo Clinic Cancer Research Fund. 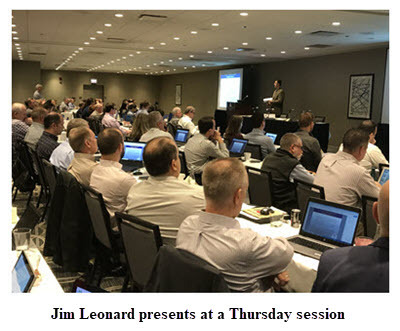 All seats were filled at the 2018 Seminar on Effective P/C Loss Reserve Opinions: Tools for the Appointed Actuary, held Thursday and Friday in the Chicago area. The two-day seminar provided participants with information on the relevant requirements and instructions for P/C actuaries working on reserve opinions, included reviews of applicable actuarial standards of practice and qualification standards and provided attendees with examples through interactive case studies. Presenters included Academy Committee on Property and Liability Financial Reporting (COPLFR) Chairperson Kathy Odomirok; COPLFR member and Academy Past President Mary Frances Miller; and members of COPLFR and its Opinion Seminar Subcommittee, including those who have a regulatory background. Academy Secretary-Treasurer and Committee on Qualifications member Tom Campbell recapped the Academy’s recent professionalism activities and the structure of actuarial professionalism, including the Code of Professional Conduct and the U.S. Qualification Standards, at Aetna’s actuarial forum in Hartford, Conn., on Friday. The U.S. Government Accountability Office (GAO) has a public employment opportunity for a senior property and casualty/general insurance actuary position. GAO advises Congress and federal agencies on ways to make government policy more efficient, effective, ethical, equitable, and responsive. The incumbent, which will report to GAO’s chief actuary, will provide technical analysis and conceptual insight on actuarial aspects of federal programs and policies related to P&C / general insurance. Information on the Washington, D.C.-based position is available via USAJobs by clicking here (general public) or here (qualified federal employees, veterans, or individuals with disabilities). The application deadline is Jan. 11, 2019. The Pension Benefit Guaranty Corporation (PBGC) is seeking to fill two senior actuarial positions within its Policy, Research, and Analysis Department in Washington, D.C. The application deadline has been extended one week, through next Friday, Dec. 14. For more information on the position via USAJobs, or to apply, click here. The Academy has long supported government employers who are seeking to hire qualified actuaries. See our Public Employment Opportunity Posting Policy for more information. The Joint Board for the Enrollment of Actuaries (JBEA) is seeking applications for the next term for membership of the Advisory Committee on Actuarial Examinations, which begins on March 1, 2019, and ends on Feb. 28, 2021. The JBEA asked the Academy to make this opportunity known to our members. The Advisory Committee plays an integral role in assisting the Joint Board to offer examinations that test the knowledge necessary to qualify for enrollment. Its duties include recommending topics for inclusion on the Joint Board examinations, reviewing and drafting examination questions, and recommending passing scores. Information on how to apply is available via the IRS website. Applications are due today, Dec. 7. Congress passed—and President Trump on Friday signed into law—a bill to extend the National Flood Insurance Program (NFIP) through Dec. 21. The latest NFIP extension followed a one-week extension that was set to expire today, Dec. 7, and marks the ninth extension of the NFIP since Sept. 30, 2017. Read the Academy alert. The Centers for Medicare & Medicaid Services (CMS) released a final rule on the methodology for the risk-adjustment program operated by the U.S. Department of Human Services (HHS) for the 2018 benefit year. The CMS Office of the Actuary also released data on U.S. national health expenditures for 2017. Read the Academy alert. A report published by Willis Towers Watson cited the Flood Insurance Work Group’s public policy monograph, The National Flood Insurance Program: Challenges and Solutions.